Oh yes, these fashions were like 10 years back. 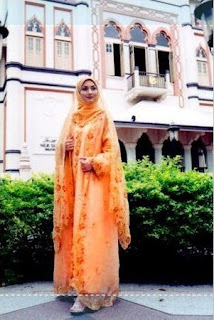 Nowadays, we in Malaysia tried combining different fashion styles for weddings. The materials used in one of these pictures is called the SONGKET, its a traditional wear. I'm not sure of the first picture (don't think its from Malaysia), but others feature our Malaysian Artist - Sasha Saidin, also a singer. I remembered my wedding, i had all white for myself and husband, did not want anything too fancy, just simple, but elegant. Maybe Hijab Style would want to feature reader's wedding pictures? :) just a suggestion.. Except for the first picture, the rest of the bridal wear is actually from Inai Bridal if I'm not wrong. Inai Bridal is a bridal service/company in Singapore; the model is Sasha, a malaysian artiste. Anyway, if anyone's interested to know, the style and bridalwear featured is mostly the Malay traditional kebaya and songket (a type of fabric). I was a hijabi bride in Pakistan in dec 07. It took me months to find a salon that would know how to set the hijab in a way that it didn't look awkward. Please ask your reader to get in touch with me or find me on facebook. I have pictures that she can get an idea from. And can also refer her to the place I got ready from. It's possible to look gorgeous on your wedding and observe hijab. Ohhh I love the 1st one too!! hey! i think the model no.2 to the end is an artise from malaysia..haha! i like the first one..its gr8..i was wondering for a long time how to wear a hejab in my wedding including jewellaries..so,thx al lot jana..but it will be very gr8ful if u can post a video clip of asian bridal showing the head covering thing including jewellaries. anyway thank u for sending this post.i am inspired. I think there are a lot of readers that have pictures of hijabi brides. Could you maybe get some of those pictures and post them on your blog. I think your blog is awesome and love the styles. thank you thank you thank you...i'm getting married this summer so like this is very helpful ...but like colour will never do. my family is hell-bent on white..its traditional. but these are way pretty. Selam Aleikum and Hi! Wonderful pictures - I'm getting married soon and am having major issues with managing hijab and pakistani veil - it doesn't help whnr the colour of my dress is red. I would greatly appreciate any pics or advice about how to go about doing my hijab for the day! Barak'allahu feekum in advance! 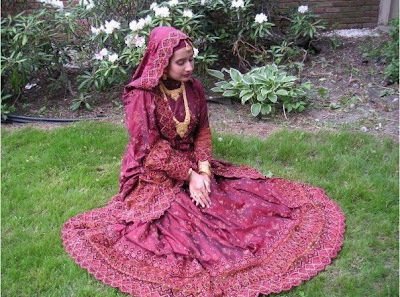 i'm getting married next year in Pakistan and want to wear hijab along with the traditional pakistani dress, can anyone please tell my where i can get ready from? Im also a Pakistani & I wanna know where in Pakistan u found the saloon for hijab styles for brides..???? You mentioned that u've some pics of Pakistani/Indian hijabi brides. My sister is getting married this summer and she wears the hijab. I was wondering if u can plz send me some pics/videos on how to wear hijab with pakistani dresses? I would also like to know what r some good places to purchase the hijabs and designers? Also Samar which salons did u find that were good with hijabs. Plz inform me of any issues. Can anyone tell me gud salon in Pakistan who knows how to set hijab and jewelery of a bride..